← Collisioni – A collision of music, wine…and food! It’s International Albariño Day! I’m so glad they give this grape its due course and deservedly so! It’s crisp, refreshing tropical fruit wines are perfect for a hot summer day to sip on the patio, share a glass with a girlfriend, or to indulge in one of the most magical of pairings: Salt and Vinegar chips! I once did a wine tasting for a baby shower (yes, you read correctly) where this was the third baby, and what else do you do for a mother who has just given birth to her third daughter? Give her a wine tasting, and then buy her wine! And when said wine goes fantastic with salt ‘n’ vinegar chips, you’ve got a winner! Winning wine? Albariño! You might also know this grape as Alvarinho, found in northern Portugal, which is where the grape actually originates, but also found over the border in the Galicia district and known here as Albariño, it is considered to be among the oldest varieties of the northwest. This grape is dominant in the DO of Rias Biaxes, and like many other grapes from this area it’s hot, hot, hot! You might find aromas and flavours that run the gamut of both fruity and floral – orange, grapefruit, peach and sometimes even green apple, passionfruit and mango to honeysuckle, orange blossom, lemongrass and acacia blossom; the acidity can be racy on wines made with albariño, but the firm structure and full body keeps it all in balance. There can even be a saline tang detectable on these wines, no doubt due to its proximity to the Atlantic Ocean. There might be many albariño wines on the market, but these two are great! 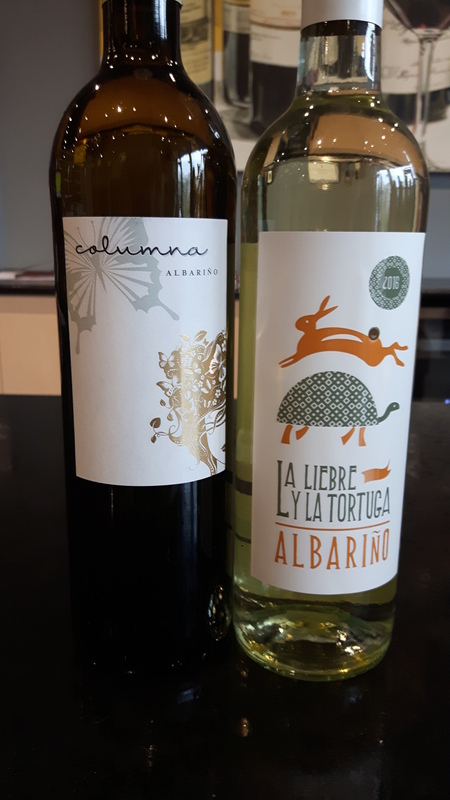 La Liebre y La Tortuga (the Tortoise and the Hare)– a clever little name for a nice little bottle of wine! Grapes are hand picked from selected sites. Aromatic with passionfruits and green apple with bright, zesty acidity and super fresh! All this goodness for only $23! Enjoy any Albariño you try today, and crack open a bag of salt ‘n’ vinegar chips while you’re at it! Happy Albariño Day and Salud! This entry was posted in Varietals, wine and tagged Albariño, Alvarinho, Atlantic Ocean, celebrate, floral, fruit, international, mineral, Portugal, Rias Biaxes, Spain, wine. Bookmark the permalink. Not that I needed an excuse to drink my favorite Spanish white, but thanks for letting us know! Saludos!